By Rose Riot South By South West (SXSW) is a 10-day film, music and interactive conference that happens every year in Austin, Texas since 1987. It has been the career starting place for many musicians and a place for bigger name musicians to play for intimate crowds. 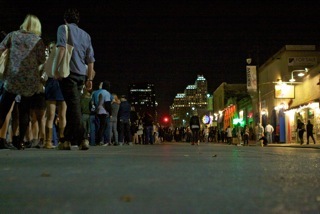 SXSW has been on my "bucket list" for many years. My only reservation was that I would need to have help with the 15-plus-hour drive. As long as I could get help, I would do it. Luckily, I found the world’s best co-pilot, my friend Jen. I picked her up on Tuesday morning and we set out for what could be no less than a rock and roll adventure. 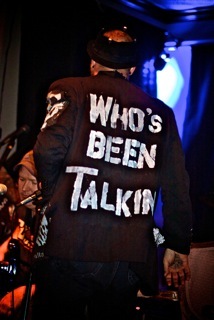 We rolled out early the Wednesday morning with SXSW on the brain. I researched bands and answered e-mails while Jen drove us in. I met up with Tony Hundahl at Rock of Ages Tattoo to get a VIP pass for the famous Emo's nightclub. Due to last minute nature of this trip, I wasn't able to apply for press credentials, which would have given me access to all venues at the festival, but the VIP pass was cool because everyone I wanted to see that night was performing at Emo's. Pass in hand I drove to the SXSW area. I managed to find the most rad parking space ever. As I was parking I happened to see my friend Gary Lindsey. Seeing him on the street was a crazy coincidence. I yelled his name from the car, jumped out, we exchanged hugs and both agreed this meeting was "crazy." Then, we all went to Casino El Camino for an interview. He had some great stories about tattoos, like Guy Aitchison doing a cover on his arm 20 years ago or how a fan got a portrait of Gary's face on his leg. Casino El Camino was everything you would want in a bar, if you're cool. Old punk music, cheap drinks and Mr. Lifto as your bartender. I recognized Lifto an hour earlier when I was waiting at the bar with Gary. I was a little worried that Mr. Lifto would be tired of tourists asking him to "lift" things and that he might be over talking about Jim Rose Circus. He was, however, wearing a Jim Rose Circus t-shirt just like the one I got at Lollapalooza 20 years ago. After drinks at El Camino it was time to talk to Oliver Peck. 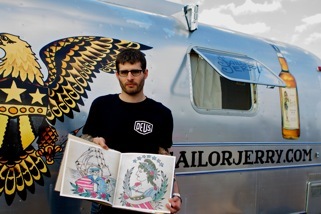 Oliver was spending the week working out of the Sailor Jerry Airsteam doing exclusively Sailor Jerry flash. Oliver was more than happy to do a spur-of-the-moment interview with me while he tattooed guitarist Ian [McDougall] of The Riverboat Gamblers. I also met Nick Schonberger, a contributing writer for the newest Sailor Jerry book, Homeward Bound. Nick is a tattoo scholar/expert and he had some amazing work done by Bailey Hunter Robinson, Maxime Buchi and a fresh leg piece by Oliver. The Sailor Jerry Rum Company is currently touring the country promoting the book and the rum. Spreading joy across the land in a fleet of five Sailor Jerry Airstreams. The next stop would be Emo's main room to see the band OFF! who happened to be opening for Bad Brains. We rested and finished our cocktails then walked back to Emo's. We managed to get inside just in time to get a good standing spot right in front of the stage. 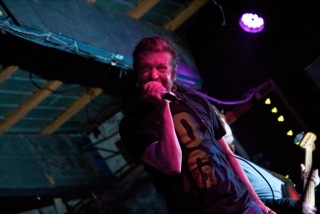 Keith Morris, former singer of Black Flag and Circle Jerks, jumped onto the stage, sporting new Vans and old dreadlocks. I felt like I had gone back in time to the skate-punk days of L.A. Keith was full of stories and social angst... After OFF! came Bad Brains. I had heard horror stories of HR doing outlandish things on stage and forgetting words. I braced myself, not just against the crowd of 500 fans, but also for a disappointing show. The Bad Brains' sound check took way too long and this did nothing to sooth my fears of a poor performance. It was the original Bad Brains line up, fingers were crossed. The stellar musicians took the stage and then slowly, out walked a very frail, old man. It was HR. He surprised me by sounding amazing! I couldn't believe what I was seeing and hearing. 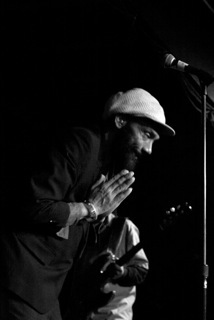 Bad Brains was truly like taking a step back in time. 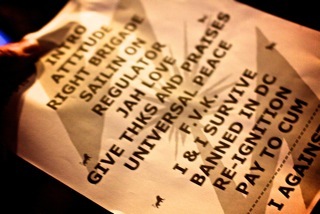 Seeing a performance by Bad Brains was yet another thing to check off the bucket list. On the other end of Emo's the band Warbeast was about to go on. I went through the venue to get to what was known as “Emo's Junior.” Warbeast is a Housecore band that I saw a few months ago in Atlanta. 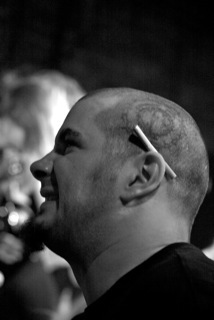 They have been touring with Phil Anselmo's [Pantera] band, Arson Anthem. When I saw them in Atlanta I was blown away by a storm of metal and hair. I knew that show would not be the last time I saw them. The Texas boys definitely lived up to the saying, "Don't Mess with Texas." 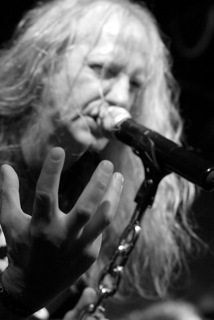 Warbeast drove devil fingers into the eyes and ears of all in the room. It was at this show that I met up with Hundahl again, and the long day had come full circle as I gave him his VIP pass back.